^ a b c PDB 1FPY; “The crystal structure of phosphinothricin in the active site of glutamine synthetase illuminates the mechanism of enzymatic inhibition”. Biochemistry 40 (7): 1903–12. (2001年2月). doi:10.1021/bi002438h. PMID 11329256. 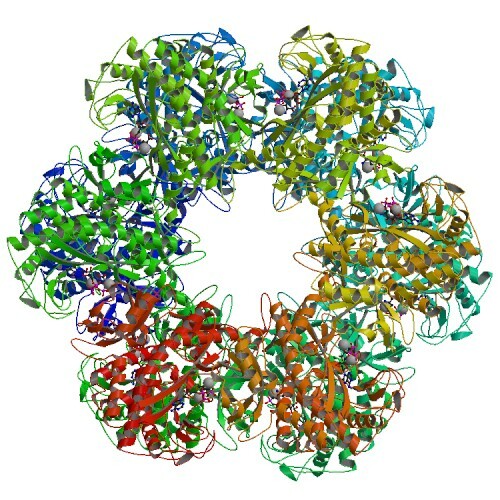 ^ PDB 2GLS; “Refined atomic model of glutamine synthetase at 3.5 A resolution”. J. Biol. Chem. 264 (30): 17681–90. (1989年10月). PMID 2572586. ^ “Some evolutionary relationships of the primary biological catalysts glutamine synthetase and RuBisCO”. Cold Spring Harb. Symp. Quant. Biol. 52: 483–90. (1987年). doi:10.1101/sqb.1987.052.01.055. PMID 2900091. ^ a b c d e f g h “Discovery of the ammonium substrate site on glutamine synthetase, a third cation binding site”. Protein Sci. 4 (11): 2358–65. (1995年11月). doi:10.1002/pro.5560041114. PMC 2143006. PMID 8563633. https://www.ncbi.nlm.nih.gov/pmc/articles/PMC2143006/. ^ a b c d “Feedback inhibition of fully unadenylylated glutamine synthetase from Salmonella typhimurium by glycine, alanine, and serine”. Proc. Natl. Acad. Sci. USA 90 (11): 4996–5000. (1993年6月). doi:10.1073/pnas.90.11.4996. PMC 46640. PMID 8099447. https://www.ncbi.nlm.nih.gov/pmc/articles/PMC46640/. ^ a b c d e f g h i j k l m n “Structure-function relationships of glutamine synthetases”. Biochim Biophys Acta 1477 (1–2): 122–45. (2000年3月). doi:10.1016/S0167-4838(99)00270-8. PMID 10708854. ^ a b c d e f g “Structural model for the reaction mechanism of glutamine synthetase, based on five crystal structures of enzyme-substrate complexes”. Biochemistry 33 (3): 675–81. (1994年1月). doi:10.1021/bi00169a007. PMID 7904828. ^ a b c d Biochemistry (6th ed.). San Francisco: W.H. Freeman. (2007). pp. 679–706. ISBN 0-7167-8724-5. ^ a b c d e “Crystal structures of mammalian glutamine synthetases illustrate substrate-induced conformational changes and provide opportunities for drug and herbicide design”. J Mol Biol 375 (1): 317–28. (2008年1月). doi:10.1016/j.jmb.2007.10.029. PMID 18005987. ^ “Some effects of adenylylation on the biosynthetic properties of the glutamine synthetase from Escherichia coli”. Biochemistry 9 (3): 633–49. (1970年2月). doi:10.1021/bi00805a025. PMID 4906326. ^ “Metal ion requirement by glutamine synthetase of Escherichia coli in catalysis of gamma-glutamyl transfer”. Arch Biochem Biophys 166 (1): 102–24. (1975年1月). doi:10.1016/0003-9861(75)90370-7. PMID 235885. ^ a b c d “Glutamine synthetase in brain: effect of ammonia”. Neurochem. Int. 41 (2–3): 123–42. (Aug–Sep 2002). doi:10.1016/S0197-0186(02)00033-5. PMID 12020613. ^ a b “Inhibition of glutamine synthetase reduces ammonia-induced astrocyte swelling in rat”. Neuroscience 71 (2): 589–99. (1996年3月). doi:10.1016/0306-4522(95)00462-9. PMID 9053810. ^ “Effect of glutamine synthetase inhibition on astrocyte swelling and altered astroglial protein expression during hyperammonemia in rats”. Neuroscience 131 (2): 437–49. (2005年). doi:10.1016/j.neuroscience.2004.10.045. PMC 1819407. PMID 15708485. https://www.ncbi.nlm.nih.gov/pmc/articles/PMC1819407/. ^ “Evolution of the glutamine synthetase gene, one of the oldest existing and functioning genes”. Proc. Natl. Acad. Sci. U.S.A. 90 (7): 3009–13. (1993年4月). doi:10.1073/pnas.90.7.3009. PMC 46226. PMID 8096645. https://www.ncbi.nlm.nih.gov/pmc/articles/PMC46226/. ^ “Glutamine synthetase II in Rhizobium: reexamination of the proposed horizontal transfer of DNA from eukaryotes to prokaryotes”. J. Mol. Evol. 29 (5): 422–8. (1989年11月). doi:10.1007/BF02602912. PMID 2575672. ^ “Evolutionary relationships of bacterial and archaeal glutamine synthetase genes”. J. Mol. Evol. 38 (6): 566–76. (1994年6月). doi:10.1007/BF00175876. PMID 7916055. ^ “The 5' untranslated region of the soybean cytosolic glutamine synthetase β(1) gene contains prokaryotic translation initiation signals and acts as a translational enhancer in plants”. Molecular Genetics and Genomics 287 (11–12): 881–93. (2012年12月). doi:10.1007/s00438-012-0724-6. PMC 3881598. PMID 23080263. https://www.ncbi.nlm.nih.gov/pmc/articles/PMC3881598/. ^ “Three-dimensional structure of a type III glutamine synthetase by single-particle reconstruction”. J. Mol. Biol. 361 (4): 796–810. (2006年8月). doi:10.1016/j.jmb.2006.06.026. PMID 16879836. ^ “Evidence of covalent modification of glutamine synthetase in the purple sulfur bacterium”. FEMS Microbiology Letters 122 (1–2): 115–119. (1994年). doi:10.1111/j.1574-6968.1994.tb07153.x. ^ “Purification and characterization of glutamine synthetase from Clostridium pasteurianum”. Biochemistry 25 (7): 1589–99. (1986年4月). doi:10.1021/bi00355a021. PMID 2871863. ^ Bolay, Paul; Muro-Pastor, M.; Florencio, Francisco; Klähn, Stephan (2018年10月27日). “The Distinctive Regulation of Cyanobacterial Glutamine Synthetase”. Life 8 (4): 52. doi:10.3390/life8040052. ^ “Nitrogen control in bacteria”. Microbiological Reviews 59 (4): 604–22. (1995年12月). PMID 8531888. ^ “A cloned cyanobacterial gene for glutamine synthetase functions in Escherichia coli, but the enzyme is not adenylylated”. Proceedings of the National Academy of Sciences of the United States of America 78 (6): 3393–7. (1981年6月). PMID 6115380. ^ “NtcA, a global nitrogen regulator from the cyanobacterium Synechococcus that belongs to the Crp family of bacterial regulators”. Molecular Microbiology 6 (13): 1853–9. (1992年7月). PMID 1630321. ^ “Transcription of glutamine synthetase genes (glnA and glnN) from the cyanobacterium Synechocystis sp. strain PCC 6803 is differently regulated in response to nitrogen availability”. Journal of Bacteriology 179 (8): 2678–89. (1997年4月). PMID 9098067. ^ “Glutamine synthetase inactivation by protein-protein interaction”. Proceedings of the National Academy of Sciences of the United States of America 96 (13): 7161–6. (1999年6月). PMID 10377385. ^ “NtcA represses transcription of gifA and gifB, genes that encode inhibitors of glutamine synthetase type I from Synechocystis sp. PCC 6803”. Molecular Microbiology 35 (5): 1192–201. (2000年3月). PMID 10712699. ^ “The sRNA NsiR4 is involved in nitrogen assimilation control in cyanobacteria by targeting glutamine synthetase inactivating factor IF7”. Proceedings of the National Academy of Sciences of the United States of America 112 (45): E6243-52. (2015年11月). doi:10.1073/pnas.1508412112. PMID 26494284. ^ “A glutamine riboswitch is a key element for the regulation of glutamine synthetase in cyanobacteria”. Nucleic Acids Research. (2018年8月). doi:10.1093/nar/gky709. PMID 30085248.